In June 2006, Danna and Adam Caldwell came to us with a plan to open a DIY frozen yogurt bar (this was before fro-yo shops were on every corner). They didn’t want to be just another chic, Southern California Pinkberry knock-off. They were doing their own thing, and they wanted it clear from the start. Our immediate concern was that the DIY concept wasn’t enough to build the brand on. Instead, we focused on a distinct personality for the brand that would differentiate them long-term. 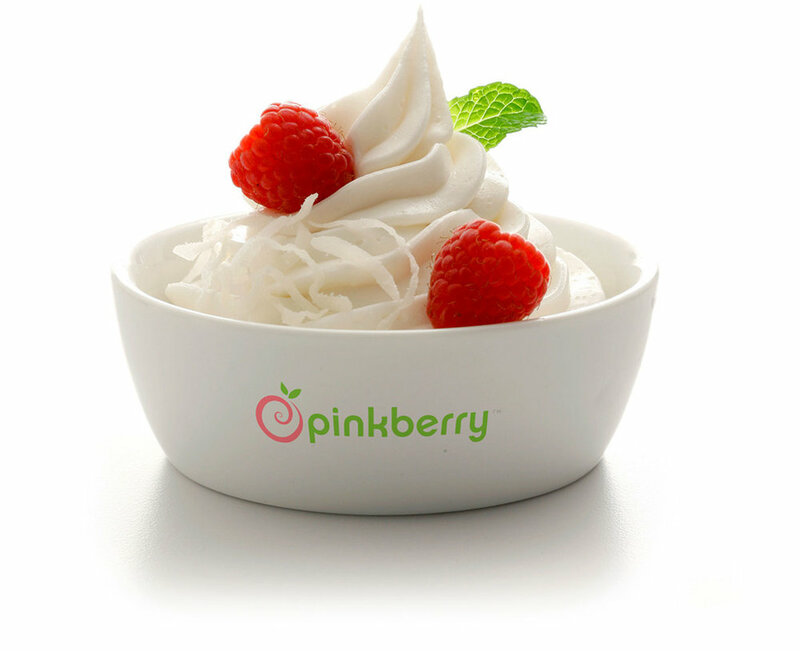 We skipped the sleek, chic Pinkberry look and went all-in on the fun. Create a fluid path for movement through the space. A circular kiosk welcomes customers and anchors movement. Directional and identification signage aids the self-serve process. Bring the playfulness of the brand into the space without going “theme park.” A mix of bright brand colors offset by natural textures keeps things from getting overwhelming. Taking their identity a step further than the logotype, we created the whimsical “Menchie” character in a kitschy, Kawaii style that could appeal both to children and adults. 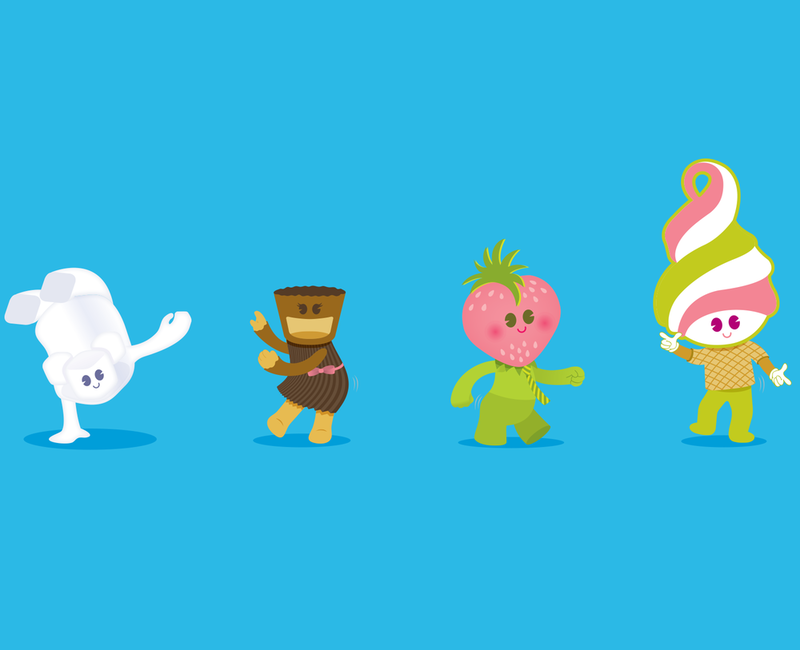 By developing a mascot and the supporting “friends,” Menchies had a proprietary set of characters that could be developed over time without dealing with licensing fees. Much like Starbucks owns the green circle on a coffee cup, we made the strategic decision that Menchie’s would own the plum yogurt cup—and it has served them well. When they first started getting attention from the press, paparazzi shots of stars carrying the iconic plum cup helped put Menchie’s on top in Southern California. Once the “ownership” was well established, we introduced limited edition cup designs to surprise loyal customers. Keeping the overall branding cohesive and consistent allowed us to be a little more playful when it came to promotional campaigns. Character illustrations interacting with real world photography and playful pop-culture references reinforces the brand personality and supports the corporate motto: we make you smile. As Menchie’s grew to an international franchise, the main character became a wonderful unifying element from country to country. Seeing him “travel” the world was both inspirational for the corporate team and for franchisees expanding into new territory. Over time, the Menchie’s website grew from a basic brochure-style site to a more expansive iteration. Back then, longer content-rich pages and infinite scroll weren’t popular web practice. Our job was to keep crucial content well-organized without losing the fun factor. "We had an idea, but Works Progress found our image. And people are really responding. The feedback we’ve gotten so far from everyone (customers, press, investors) has been so positive, we’re already making plans for more stores. Not bad for only being open six months." Joyful branding garners immediate interest from press, investors, and prospective franchisees. By focusing on the brand’s personality vs DIY process, Menchie’s safeguards from copycats. Customers demonstrate unparalleled loyalty as their passion for the brand ignites a social media frenzy. "Fro-yo shops such as Pinkberry and Valley Village‘s new Menchie‘s are attracting crowds that previously hung out at Starbucks or the Coffee Bean & Tea Leaf. Actual ‘scenes’ are developing, partially because of their interior design." Multiple units in California within 2 years. US franchise within 3 years. Global franchise within 6 years. 10-year plan to be a US franchise met within 3 years. Set the new industry standard in your category. brand strategy and design for independently-owned restaurants and quick service food retailers who want sales more than "likes." restaurants and quick serve food retailers such as bakeries, cupcakeries, coffee shops, frozen yogurt, ice cream, juice bars, smoothie shops, and more.